It is high time, gear up for one of the most royal experiences of your lifetime - The palace on wheels is an imperial train that chugs along the land of the Maharajas and Maharanis in the western India. The train was first rolled out on January 26th, 1982. One can’t describe the luxury, comfort and service in words. It is a joint venture of Indian Railways and Rajasthan tourism development corporation (RTDC). Since its very first sojourn it has been on an award and accolade winning spree, it has been voted the 4th best luxury train in the world and the best in Asia by Conde Nast magazine. This out of the ordinary train has a seating capacity of 104 with 23 coaches and two super deluxe suites, two resto bars, 13 deluxe saloons, improved water supply and storage, international spa facilities, boardroom and internet facilities. When talking about all the amenities inside the train one cannot really keep the interiors barred. They are exceptionally beautiful and phenomenally exquisite. 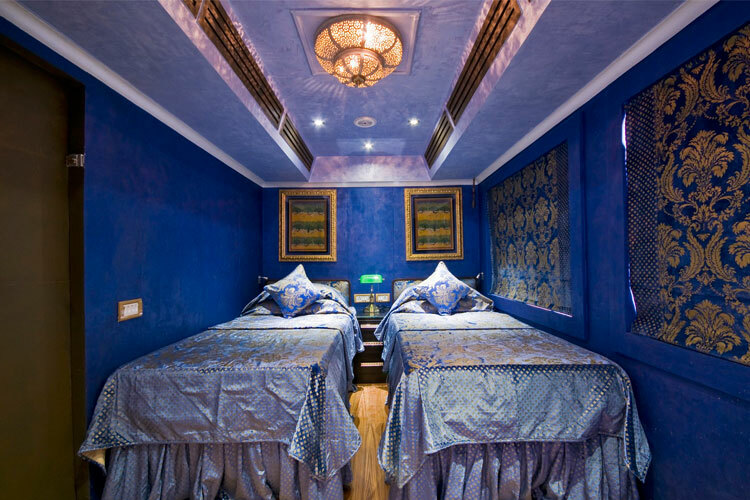 Each deluxe coach reflects the style of erstwhile princely states and all of them have attractive colour schemes to match. The train begins its sojourn for the next 7 days from New Delhi. It passes through Jaipur, Bikaner, Jodhpur, Udaipur, Jaisalmer, Chittorgarh, Bharatpur and Agra and then comes back to Delhi. 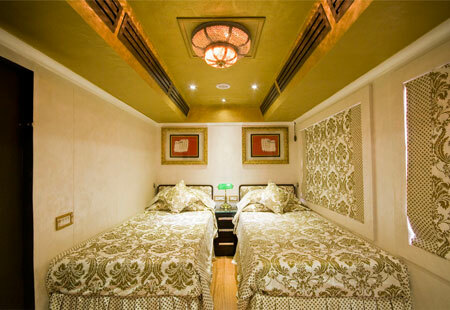 This train is a luxurious option to traverse the desert in the shortest time possible. The state of Rajasthan is a melange of colours, customs, cultures and mores. It’s vivacious colours and the monochrome desert is sprinkled intermittently with national parks, wildlife sanctuaries adventure and living traditions, with an addition of shopping, handicrafts and all its titbits, it becomes s a tourist wonder. It was a long time since I last toured Rajasthan, so I decided to give it a go yet again but this time I wanted to be a royal spender. I wanted to tour the royal state, royally! A friend introduced me to the Worldwide Rail Journey’s website. I quickly logged into it and I chose ‘Palace of wheels’, this had been a fantasy of my school days. After I had booked the tickets online, I was surprised at the customer service of WRJ, one could have the silliest of queries in mind and they were always there to answer them. The representatives of Worldwide Rail Journeys actually made me feel like a king from day one! That was just the beginning. I was waiting with bated breath for the D-day and it did arrive. My journey started from Delhi and in the next day the train arrived at Jaipur, where the other guests alighted from the train and so did I to take a stroll around famous monuments and feast our senses on the grandeur of each one of them. The Amber Palace that stands tall to this very day with its enchanting orange in the midst of the barren landscape, all done up in sheer royalty is enough to take you back into the yonder years, the Hawa Mahal and city palace are some of the other major attractions in Jaipur, while visiting these monuments I was reminded of the time when I visited these places as a kid. I tried to figure out the differences that my opinions and views had at that time with what they have become of now, I was floored with their transformation. From afar it looked like a hamlet that’s entirely made of gold just as it always did. As I got closer to it I touched the ‘Sonar Kella’ (Golden fort), and its yellow sandstone heated by the mid-day sun, images of my childhood conjured up in my mind and it was beautifully nostalgic. We also were in the midst of the Sam sand dunes, the ornamented camels and the white dhoti clad camel pastoralists, we also visited the ‘Havelis’ on the Trikut Parvat (hill) and also the fort built by Rawal Jaiswal. Our next stop was Jodhpur where we reached on the 5th day, we visited Jaswant Thada; we revelled in the glory of the Mehrangarh fort and marvelled at the sights and sounds of the blue city from atop. The Umaid Bhawan Palace was also an architectural splendour. After Jodhpur, it was Chittorgarh and on the seventh day the train takes you to two places Agra and Bharatpur and from there back to Delhi which marked the end of this momentous journey. I will forever be thankful to worldwide Rail journeys for their constant support right from the very beginning to the very end of my journey and would urge everyone to book the tickets to all the Luxury trains in India through Work Wide Rail Journeys especially if you want to experience what it feels to be treated royally!